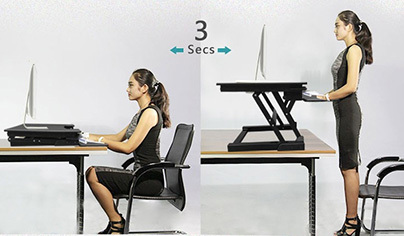 It is difficult to spend too long standing hours, so it is advisable to alternate between sitting and standing positions during the day. 1. Make your muscles move! The eye is a muscle and fragile organ that must be managed. It is essential to take breaks during the day in order to reset its view by focusing on its fixed point. According to a recent survey we spend nearly 8 hours a day in front of a computer and 87% of employees recognize that they stay away from us for long periods of time. These habits are often harmful and may become discomfort or even pain. For François Carré, one of the main causes of the increase in sedentary lifestyle is THE PROLIFERATION OF SCREENS around us. We move less and less. It is for these reasons that it is advisable to change postures during working hours (move from sitting to standing and walking a few minutes). Health professionals such as Frédéric Dutheil, a recognized specialist in sedentary lifestyle, director of the Center for Occupational Pathologies at the CHU in Clermont-Ferrand, alert us to the evolution of our lifestyles*. Physical inactivity and reduced physical activity now pose risks to our health. It is difficult to spend too long standing hours, so it is advisable to alternate between sitting and standing positions during the day. A first objective would be to spend at least 2H PER DAY IN STANDING POSITION AT WORK, THEN TO TRY TO ACHIEVE AN IDEAL DURATION OF 4H. The work environment has evolved to become a sedentary facilitator and for this reason UNILUX will offer from 2018 a vision of the workplace active through a range of products that makes the workplace dynamic. 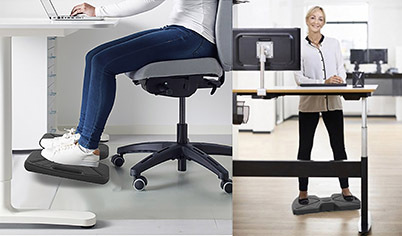 UPDOWN: a versatile and user-friendly foot rest to used in both sitting and standing avoids muscle and back pain associated with poor posture in oder to RELAX TO BE MORE PRODUCTIVE AND INCREASE YOUR INTELLECTUAL PERFORMANCE IN YOUR WORKPLACE. 4.The benefits of this dynamism! By reducing the risk of developing certain cancers.